China's currency is on the ropes, sliding to four-year lows this week. It all started back in August, when China stunned markets by announcing a 2% devaluation -- the biggest one-day fall in the yuan in more than two decades. The slide has continued since, and further losses are likely -- analysts say -- following the International Monetary Fund's decision to promote the yuan to its elite basket of global currencies from October next year. That's because China will face more pressure than ever to show its commitment to economic reforms, and further relax its grip on the yuan. The IMF decision "should see the People's Bank of China having a more hands off approach," wrote HSBC's Paul Mackel in a research note. China's central bank said it engineered August's shock fall because it believed the yuan was overvalued. Beijing still sets a midpoint value for the yuan each day, allowing it to fluctuate within a 2% range above or below that rate. But the central bank now takes greater consideration of the previous day's closing price when setting the midpoint, meaning the currency can move lower -- or higher -- in a controlled fashion. The volatile environment has already prompted massive capital outflows from China -- $500 billion this year through October. 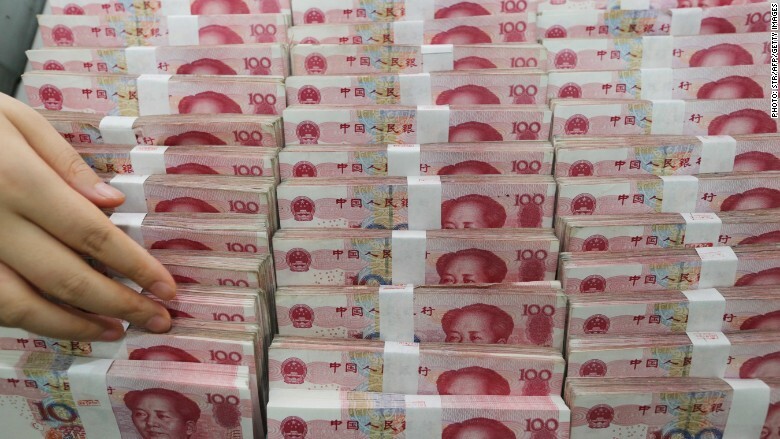 Still, a cheaper yuan isn't all bad news -- it could help China's manufacturers. Exports from China have fallen for the past five months.